I crawl out about sunrise from between my two blankets, put on my shoes, walk out of my tent, hunt a basin, & wash my face, comb my hair & my toilette for the day is complete. By this time breakfast is ready & if General [Jackson] has made his appearance, we sit down & are regaled with corn bread & leaden biscuits, fried bacon & cheese, a little molasses & coffee with sugar as brown and wet as possible. After breakfast & a chat I light up my pipe & walk around to talk over the news of the day, the possibility of moving. Then I make out my reports & afterward proceed to amuse myself as best as I can do so to get through the day with the least tedium possible. I generally manage by reading & talking & visiting to do pretty well. Though as for visiting, I can’t do much as I must be about headquarters all the time to answer any call from the General. About every third day I ride to Manassas [Junction] which serve me a whole morning, and sometimes I go out foraging. Thus I go until nightfall when we again assemble to talk & read the papers, if we have any, & turn to our respective beds, the preparation for which consists in pulling off my shoes. Sometimes we think of the Civil War as battle after battle. Yes, there were times when that happened, but autumn 1861 is not really known for that…which is why it usually gets glossed over in the history books. Both sides were recruiting larger armies, training, and waiting. For many men, this was not their idea of war, but most found ways to keep busy and filled their days with work or amusement. By 1862, many would be wishing for the semi-relaxed days and “boring” times in camp; at least it was safe. 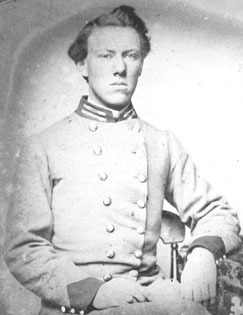 Alexander S. Pendleton (better know by his nickname “Sandie”) served on General “Stonewall” Jackson’s staff in 1861. As an officer his daily routine was more casual than many of the soldiers’, but he still had work to do. And he couldn’t venture far from camp in case the general needed him. That was the summary of the duties of staff officers: they had to be available at any time to complete any task to ensure the success, provisioning, quartering, or other good of the army. Interestingly, it’s usually the generals who get all the credit for their battlefield or training successes, but those victories would’ve been basically impossibly with the aid of their staff officers. Various departments – like quartermaster, artillery, medical, engineers, signal, inspectors, and commissary – all worked together to ensure the success of the army or other military unit. If someone didn’t do their job properly, disasters could occur. The fate of armies – perhaps the war – often rested in the hands of staff officers while the generals got the glory or the shame. Fortunately, Sandie Pendleton was one of the best staff officers in the Confederacy. Once Jackson referred a questioner to Pendleton saying, “Ask Sandie Pendleton. If he does not know, no one does.” Pendleton would serve as “acting” assistant adjutant general for Jackson and continue his military service as chief of staff under Generals Ewell and Early. Pendleton was mortally wounded in 1864. One particular thing that stands out to me in this quote is what these staff officers did for amusement. Many of them were quite young (early twenties) and they found ways to entertain themselves in a world before electronic games. They read. They write. They walk. They go visiting. This is not an era of solitude in front of game screens. There are interactions and discussions. Friendships and comrade relationships were being built during this period in 1861. It didn’t seem like much was being accomplished, but regiments, staff officers, and generals were using this time to become better acquainted, prepared, and equipped to fight in the coming years. Much of the unity of commands and regiments was created through discussion and interactions. P.S. What pastime stands out to you in the article? Love this post, Sarah! 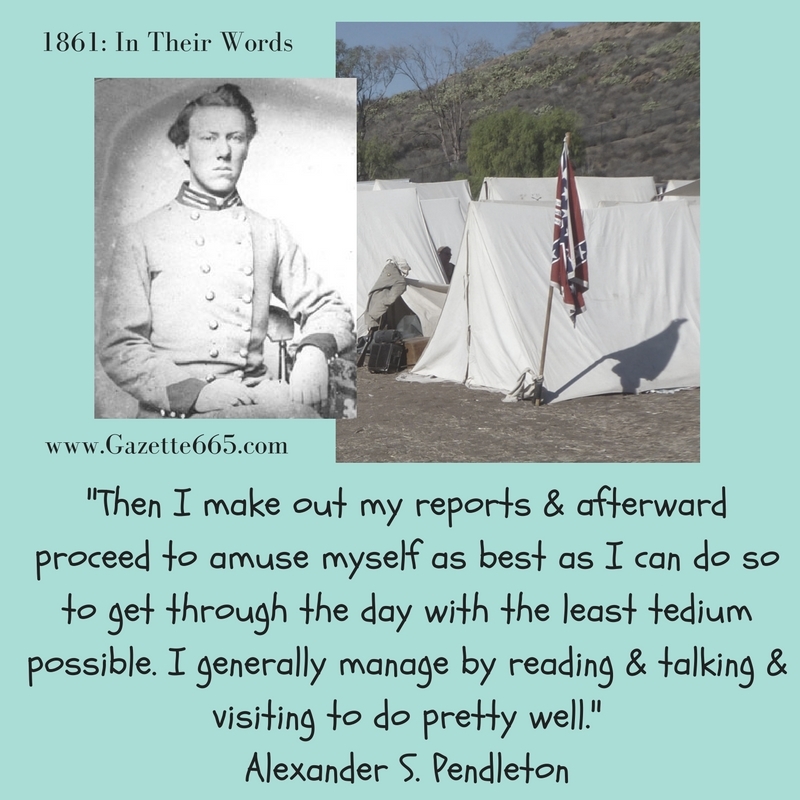 “The Tedium of War” : sounds like a good book title. I don’t believe I have seen anything quite like that, and that is saying something in the Civil War field. Hmm… That would be a unique book. And definitely one that’s needed!